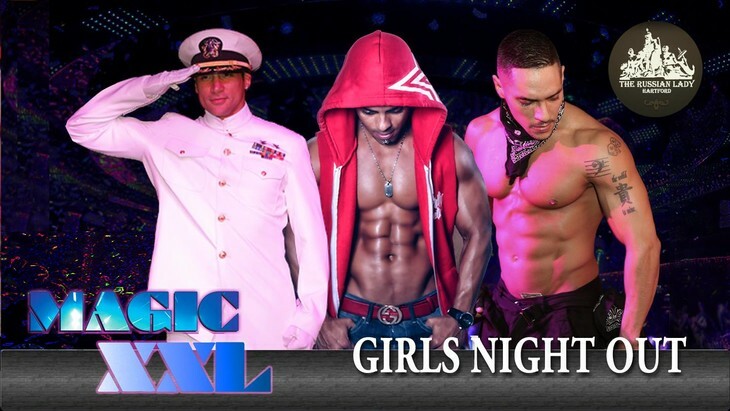 "MAGIC MIKE NIGHT" in Hartford with Men in Motion Dancers! ALL IN ONE SPOT!! - HAVE DINNER @ "THE TAVERN", SEE THE SHOW, DANCE ALL NIGHT! RIGHT NEXT DOOR - PARTY WESTERN STYLE AFTER THE SHOW @ "THE ROCKING HORSE SALOON"
Individual VIP Tickets $35 are for the FRONT ROW ONLY, Limited Amount! * VIP Tickets are the front section near the male dancers. They go to you first! * VIP Tickets goes ahead of the General Admission in line to the Russian Lady. GENERAL ADMISSION 2 Pack $40 ($10 savings) for the General Admission Section, Limited Amount! General Admission Tickets are right behind the VIP Section. GENERAL Admission Tickets are around the perimeter of the venue. Girls can see the show easily!